Taipei, Taiwan – MSI is the first in the professional market to launch mobile workstations with Intel's latest 6th Generation Skylake Core-i7 and Xeon processors. Powered by Intel’s latest platform, the new WT72 joins the market with its classy taste, thanks to a series of MSI-exclusive innovations that help create a premium user experience and greater value-added for professional users. Codenamed Skylake, Intel’s latest 6th Generation Core-i7 and Xeon processors are of 14nm microarchitecture. They deliver power-efficient yet even more powerful performance than their predecessors. Performance-wise, Skylake Core-i7 is widely considered to have a 20% performance bump compared to the 4th Gen. Haswell Core-i7. While on the memory side, four DDR4-2133 SO-DIMM slots with a configurable maximum of 64GB bring the fruit of an over 30% performance boost compared to DDR3L-1600 setup. Powering the highest-performing mobile workstations, the latest MSI WT72 Mobile Workstations packed the Intel® Xeon® processor E3-1505M to get the benefit of Error Correcting Code (ECC) DDR4 memory. It features intelligent performance that delivers the scalable processor speed necessary for advanced 3D designs, inspirational digital content creation, and traditional engineering analysis. "MSI understands professional's needs. Benefiting from MSI's strong and excellent knowledge in Mobile Workstations and with deep R&D experiences, the latest MSI WT72 Mobile Workstation series are created to address the needs of nearly all types of work environments and professionals, such as designers, architects and video production houses. 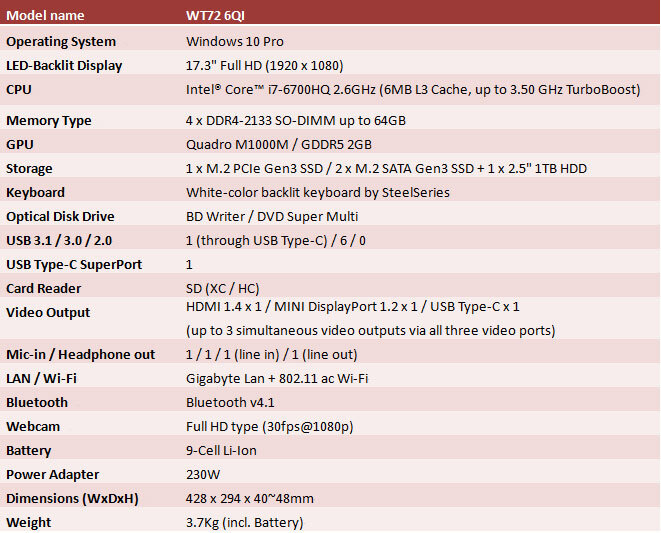 Besides being certificated by various major independent software vendors (ISV), MSI Mobile Workstation’s awesome features, such as the exclusive SuperRAID4 storage solution, Matrix Display that supports up to four monitor outputs, and the super cool CoolerBoost3 thermal technology, do not only increase efficiency at work, but also provide a more reliable work environment for professionals”, says Eric Kuo, Vice President of NB Sales & Marketing at MSI. 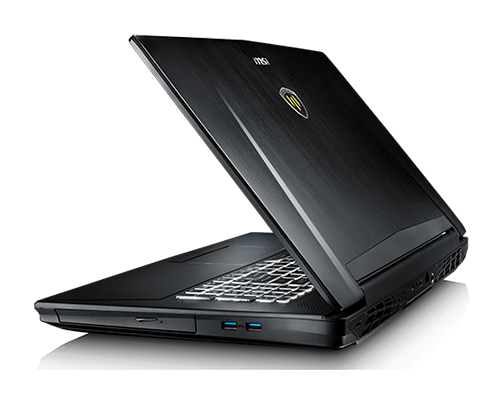 Powered by NVIDIA's Quadro M-series GPU, the latest MSI WT72 Mobile Workstations enjoy great advantages of the state-of-the-art Maxwell architecture by the chip giant. With MSI WT72, challenging visualization workloads such as 3D-modeling and rendering calculations are to be taken care of in an effortless manner, thanks to the 50% plus performance bump by the latest Quadro GPUs. The new WT72 Series is shipped with preloaded Microsoft Windows 10 Pro, while different models come with NVIDIA Quadro M5000M, M4000M, M3000M and M2000M graphics respectively. The new WT72 Series being certificated by Autodesk, Solidworks, PTC and other varies independent software vendor (ISV). This product is shipped with preloaded Microsoft Windows 10 Pro, More new MSI exclusive technologies are introduced in this model, such as Super RAID 4, for boosting extreme read speeds over 3300MB/s, PCI-E Gen3 X4 M.2 SSD for boosting extreme read speeds up to 2200MB/s, DDR4-2133, for supreme data transmission speed, Super Port, for delivering two 4K displays, fast data, and quick notebook charging, and Nahimic Audio Enhancer, creating directional sound effects for true professionals. Heat is one of the most original forms of energy on earth. As the law of physics says that more energy can generate more heat, cooling is therefore a knotty yet inevitable task to take on. MSI’s advanced ‘CoolerBoost 3’ employs two dedicated fans for the GPU and the CPU. Joined by a total number of five heat pipes made of thermally efficient copper, even more contact surfaces are assured on top of the ample airflow that the dual-fan design allows. Now the top-notch thermal engineering of MSI CoolerBoost3 is never so handy. With just one press on the ‘fan boost’ button, the decision for effective heat exchanging is right on the fingertips, making the world’s most efficient yet considerate thermal solution. MSI SuperRAID4 technology is the market’s most advanced and fastest storage solution. Consisting of two NVMe PCI-E Gen.3x4 SSDs in RAID0 setup, this storage solution takes all the bandwidth as well as scalability advantages that are there to fully unleash the potential of SSDs. At a read speed of over 3300MB/s, SuperRAID4 can save a professional’s day when frequent access to large-size data sets is essential. Get the most advanced storage before everyone else with the latest 4-lane PCI-E Gen.3 SSD that marries NVMe logical interface, which reads at a top speed of 2200MB/s – that is 5x faster than SATA3 interfaced SSDs. *Optional for WT72 6QI with HM170 PCH Series. With over 2.9GB/s reading speed and 3.5GB/s in writing, and more than 30% faster performance than DDR3-1600, the DDR4-2133 is the new benchmark for premium mobile workstations that takes work efficiency into a whole new level. System stability is paramount when weighing quality of mobile workstations. With MSI WT72, Error Correcting Code (ECC) DDR4 memory is the key to the peace of mind. ECC memory detects and corrects single-bit memory errors that can lead to data corruption and further cause system crush, and gives substantial improvements on memory stability as well as accuracy during important design works. *Optional for WT72 with CM236 PCH Series. The military knows the importance of how precise definition of sound can change the rules of war. It is the only reason for the French military to adopt Nahimic Technology into its fighting aircraft training simulators. Directional sound effects and crystal clear dialogue during a mission are two critical elements. Now, you get to enjoy a whole new audio experience, and take best advantage of your professional applications with this true military technology. Jointly designed by MSI and the Danish Hi-Fi master Dynaudio, this true 2.1 speaker system is embedded in the MSI WT72 mobile workstations, offering an audiophile experience thanks to the 50% boost of precise amplification and an over 10dBA volume increase compared to the previous gen. WT72. Sound reproduction is never so true on mobile workstations. Vision and sound are the highest concerns that define success in the field of professional 3D-modeling. You now get to see clearer than that of your rivals see, getting one step ahead of the rest. *Besides Designer Mode, True Color Technology also offers prefect color accuracy for 5 more scenarios. 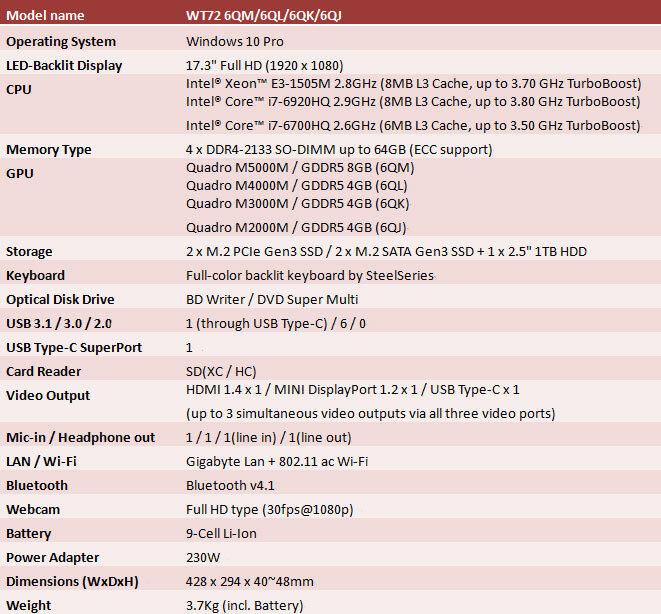 MSI workstations are ISV Certified Systems. Officially recognized by major ISVs in engineering 3D-modeling, such as AutoDesk and Dassault Systemes Solidworks, with positive endorsements on software-system compatibility, MSI mobile workstations guarantee an absolute professional experience with no comparison.